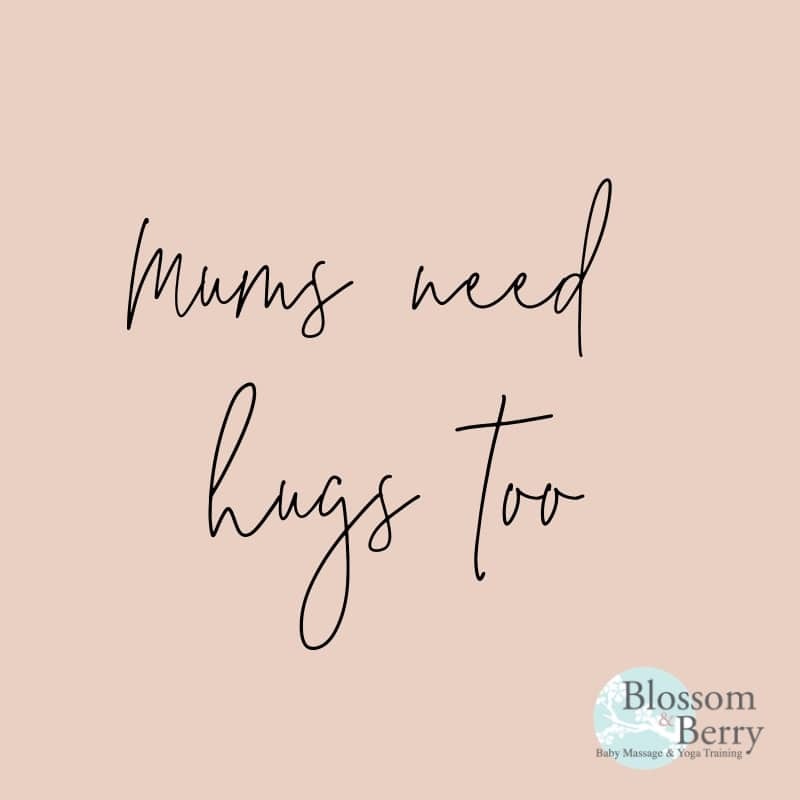 I talk a lot about the importance of touch for babies but Mums need hugs too. Hugs release oxytocin which is the hormone of mothering and love and helps makes the adjustment and transition into motherhood feel easier. From my reading and research, I believe oxytocin is essential for the health and wellbeing of new mums. There are so many ways to get oxytocin. Birth itself supplies huge amounts as it is oxytocin that causes the womb to contract. Skin to skin after birth gets the oxytocin flowing and studies show that it significantly supports the transition of your baby from the womb to the world by regulating body temperature, reducing stress hormones and boosting immunity. Breastfeeding also produces oxytocin, which is why you can feel so relaxed and sleepy once you has established feeding. After birth in many cultures, women are massaged after birth which again increases the flow of oxytocin, helps to contract the womb and restore strength. But what happens if you experienced none of that through events or through choice? How can you get the oxytocin flowing? Well I could give you a long list but instead I am making it super simple. Did you know that couples that hold hands and hug for just 20 seconds in the morning had half the stress levels during the day of couples who didn’t (Grewen). If your partner leaves for work in the morning, get a hug in to help you feel prepared for the day ahead. Serotonin, the neurotransmitter responsible for boosting your mood increases when you hug someone. Hugging can bring out the sunshine if you are feeling a bit cloudy. Hugs also boost yourself esteem. You might not be feeling too huggable right now but guess what, you are loved! It’s okay to say “I need love” “I need support” A hug can help you feel you are loved and supported. A hug gets you there fast. Having a hug is the first stage of intimacy. If you don’t like the way you look or feel not great about yourself, start with a hug. Trust the process. Start with opening up with a hug. Hugs heal and hugs make you feel happy. So if you feel like you don’t want to ask for help, or ask for a massage or ask for some time to rest….the least you owe yourself as an incredible life creator and mother is a hug. And that’s okay to ask for that hug or two of three or however many you need, because love creates love and you are allowed to fill yourself right up!